This post features Andrea Robbins. Andrea is 31, lives in Germany but is originally from the United States and is a big fan of the Fabulous Four from Liverpool, especially George! Honoured by her country, decorated by her Queen and loved here in the Beatle universe, here is Andrea Robbins! 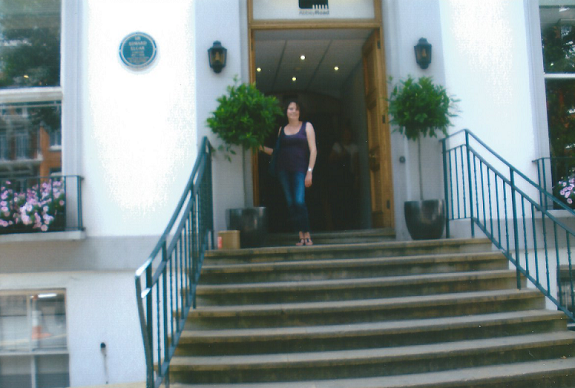 Andrea Robbins outside a very famous studio. Ever met or seen The Beatles/a Beatle live? The closest I've come to meeting any of The Beatles is being in the same concert venue as Paul and Ringo, and on the same continent as George... and, I suppose, by visiting Liverpool, London and Hamburg. As mentioned, though, I have been fortunate enough to see both Paul and Ringo live. Absolutely wonderful and priceless experiences! The impact of The Beatles? They inspire me in more ways than I could pinpoint or even fully realize! They've taught me to hold onto my dreams, to be here now, to always keep a sense of humor. They broaden my outlook, and inspire me to travel (for instance, I wouldn't have journeyed to India if not for George). As other second generation fans will probably know from their own experiences, being a Beatles fan meant that kids at school made fun of me for liking an "old band," that adults were amused and predicted it would just be a phase, and that connecting with other likeminded fans wasn't really an option until the internet became a part of daily life. In that respect, The Beatles taught me to always remain true to myself. They impact my thoughts, philosophies, fashion, and quite honestly, all aspects of my life. I'm incredibly grateful for their existence, and I couldn't think of a more fantastic soundtrack to my life than their music, collectively and solo. They certainly led me to becoming even more of a research buff - looking to collect hard to find articles, interviews and books, for instance; or delving more deeply into their Hamburg days. Suffice to say, I also wouldn't be blogging without this band, because it's really a labor of love for these Liverpudlians (though, admittedly, the focus of the blog is more on George, who as you might have guessed is my favorite). No matter what life has in store, what happiness and sadness, The Beatles and their music are there. 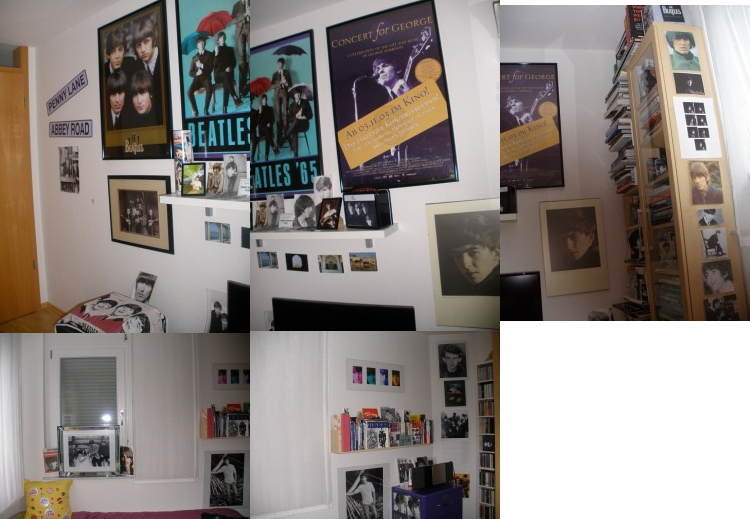 Andrea's Beatle-fied Room. Doesn't it look Fab & Gear? You simply must check out Andrea's fab blog That Eventuality which puts George (who is her favourite) in the foreground!